I am back in Beijing after a whirlwind trip to Australia. It was a good week, and I did all the things I particularly wanted to – got a new Chinese visa, celebrated my Dad’s 60th birthday with him, visited with hometown friends I haven’t seen in years, handed in my application to study in Sydney next year, and spent time with a friend who just moved there – including a tour of the campus and a look at the accommodation I will live in. So all in all, a very busy but good week. I flew Singapore air, probably my favourite airline (they had a sale on tickets that meant it was cheaper than Air Asia!) and even had my own row on most of the flights. Although after boarding the flight from Singapore to Sydney on time we sat at the gate for two hours. Without air conditioning. Not comfortable – but worse for the poor flight attendant in his blazer! A series of minor things resulted in needing to “reboot” the plane – leaving us in complete darkness for 5 minutes. After that the place was fine, but by then a few passengers were nervous and decided they wanted off. Which meant we had to sit around a little longer while their checked luggage was removed from the cargo hold. I suppose if you’re a nervous flyer sitting there could be nerve-wracking, especially given that this was about 36 hours after news of the missing Malaysia flight broke. Anyway, the captain kept us well informed throughout, and the staff were great – and even two warm hours on the ground is better than having a flight cancelled. On the way back I had a few hours at Singapore airport and visited the Butterfly Garden for the first time – it was surprisingly relaxing to wander around looking at them all! 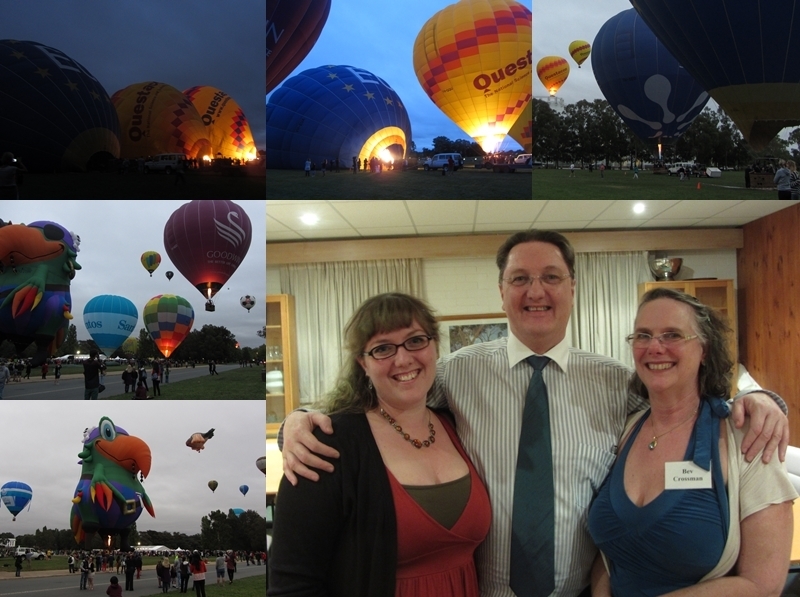 Balloons on the lawn outside Old Parliament House; with my parents after the club dinner. On the weekend my parents’ Food and Wine Club had a special dinner. They’re held once a month and my last three visits to Canberra have happily happened on club dinner weekends! A very pleasant coincidence. This month’s dinner was themed “A Salute To The World Cup” and was all Brazillian food. My Mum is the “Foodmaster” so she coordinates all the recipes and ingredients and members doing the cooking (they make all their own food, mostly in the clubhouse kitchen). I even helped with the cooking. It was a lot of fun and a lot of good food – including an awesome prickly pear sorbet! Dad is the club President, so I got to sit at the President’s table, which is complete with a President’s gong – used to get everyone’s attention. Throughout the meal there are breaks during which members who cooked talk through what they made, and everyone has a chance to share their thoughts on the food, the wine, and everything. It’s really quite interesting, and enjoyable, and it was nice to hear so much positive feedback on all the work Mum puts into it. The next day was Dad’s birthday which, at his insistence, was kept low key. We had fun celebrating quietly at home. Then the next morning I was off in a hire car, driving myself to Sydney and the SMBC campus where I plan to study next year. Even sight unseen I was quite confident that it was a good fit for me, and after visiting I can really see myself there. That night I visited with another friend who lives in the city; turns out her flat has a 180+ degree view of the harbour (including the bridge and opera house)! Not bad at all. We had dinner in a pub down the street and looked at some photos (and her wedding invites!) and I crashed in her living room before getting up at super-early o’clock to head to the airport. My past two visits to Australia (at Christmas and now) have been the easiest trips “home” I’ve made in ten years. Have they been easier because I’m already looking ahead to moving there next year? The thought of moving back is certainly easier given how smoothly these visits have been. I will be back in Australia in 10 months’ time, a period which seems both really long and really short. While it’s still very strange to think about not being in China, I do feel more and more at peace about the coming move.